Leroy Thomas was born in 1965 in the small town of Elton, Louisiana. The son of Zydeco great, Leo “The Zydeco Bull” Thomas is one of the most gifted and dynamic musicians on the zydeco scene today. As you can imagine, Leroy grew up in the midst of music, learning to play the drums at only eight years old. Not long after, he began learning the accordion & eventually mastered both the traditional button and piano varieties. Leroy joined his father’s band at 19 years old & wowed everyone with his innovative, hard-driving sound. In 1998, he made his first recording and has been gaining speed ever since. Thomas has performed in 39 states & 3 foreign countries over the years, and has even gotten the chance to play at a private Mardi Gras party in Houston for Mr. & Mrs. George Bush, Sr. 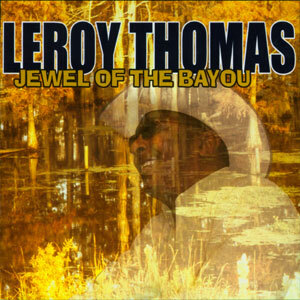 The New York Times named Leroy Thomas, “The Jewel of the Bayou,” after viewing one of his performances in the Big Apple. In 2010, Swallow Records is proud to welcome Leroy into their home and look forward to a rewarding and fulfilling musical relationship. We Love You Leroy! Indeed we do, for Thomas is always raring to go all Louisiana squeezebox on you, flashing any mundane moment into an instant party with the bright, transmissible energy of his zydeco overdrive. His tenth album wastes no time affirming its mission statement of “Everybody Dance” with the kind of grabby grooves that naturally run within his family. Leroy, you see, was born into zydeco: Keith Frank and Geno Delafose are cousins; Leo “The Bull” Thomas is his drumming father (and also the bristly guest who bawls the allnight-long blues, “Rock Me Baby”). So driving the dancehall traditionalism of “Cherokee Waltz” or some peppered “Zydeco Two Stepping” is second nature for his bejeweled accordion. But zydeco has long looked to outside sources for fresh ideas, and Thomas’ repertoire is no different. His Zydeco Roadrunners, in turn, devour Ray Charles’ “What I’d Say” with the same swampy fervor as Bob Dylan-via-Old Crow Medicine Show’s “Wagon Wheel.” Rolling down Nashville country roads, by way of “Stars on the Water” and a coming-to-grips “Troubadour,” is a particular specialty, one which gets Ronnie Rue’s guitar excitably outspoken. (Finding Buckwheat Zydeco moonlighting behind the Hammond organ is a nice unexpected surpr ise.) Amid the fun, midlife crises get buoyed: “Hey Goffie (Pick It Up),” for him; “She Can’t Hen Like She Did Back Then,” for her. “Friday Night (You Don’t Even Know),” however, remains perfectly pained all the way around, making a stately showcase for—if you love deep, impenetrable voices—one of the music’s truly great singers. Even better than a night inside El Sido’s, We Love You Leroy! throws your own personal zydeco bash. Leroy was born into the Zydeco music world; his father was a drummer in his own band and led the band while playing drums! Leroy started by emulating his father on the drums, however he always wanted to play accordion and eventually in his early teens he traded for one and taught himself to play. He is always one who stuffs his discs with songs; this disc has 16 of them, 7 he wrote and the rest are by a variety of writers. He has a knack for choosing songs that fit his strengths. He does a great version of Rock Me Baby, an older R&B song by Melvin Jackson, on which Leo Thomas, his dad, does the lead vocals. There is also a version of a song, Wagon Wheel, made popular Old Crow Medicine Show that was originally sketched by Bob Dylan, it was later modified by Ketch Secor of O.C.M.S., again done very successfully as a Zydeco romp. It seems that his magic at covering songs extends to whomever including Ray Charles. His range in Zydeco is great and particularly at adapting the songs to his styles and band. The most common complaint about Zydeco is that it all sounds the same, however when you listen to him and to Terrance Simien two of the best and most creative artists in the genre, you realize what a pile of horsefeathers that is. These two in particular have great voices and wide and far seeing vision that can see beyond the original intent of the song and re-envision it, make it their own. His band is hot and provide solid backing for him and they get you out on the dance floor, which is the purpose of Zydeco. Hard work during the day and a lively dance floor and good food and friends during the night time party. 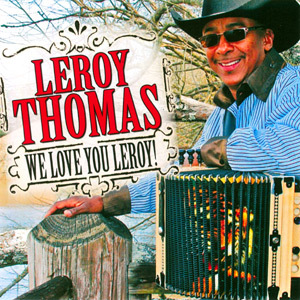 There is a good hard working joy to this music, and Leroy Thomas and The Zydeco Roadrunners know how to infuse the atmosphere so that you can’t help but have a solid, rockin’ good time. Sit back and relax when it starts because soon enough you will be up and moving to the music with a great big grin on your face and happiness in your heart. Accordionist Leroy Thomas has quite the reputation for setting feet in gleeful motion. The secret is in the syncopated shove of his zydeco. Its bass-booming rubboard rhythms are as irresistible as they are motile – specifically designed to explode in the bodies of its listeners. That makes Jewel of the Bayou a dancehall powder keg. “In Love Witcha Woman,” “(Everybody Wanna Go to Heaven) Nobody Wanna Go Down,” and Chuck Berry’s always ripping “Promised Land” all hit like a Louisiana locomotive. Even “Shuffle Zydeco” manages to run hard with the brakes on. So aside from a cool-down whistle stop like Sam Cooke’s swaying “Bring It On Home to Me,” the Zydeco Roadrunners keep the party chugging. Twistable, twitchy melodies like these are in Thomas’ 44-year-old DNA, passed down from dad Leo (who guest croons on “Come Back”) and likewise shared between cousins Geno Delafose and Keith Frank. But tucked under that cowboy hat of his is also a lyricist capable of filling this friskiness with devilish mischief. So while chuckling to alcohol’s morning-after hazard (waking beside a “Bearilla Woman”) or male woes (the Viagra-enhanced “I Think I Need a Boosta”), your feet will be a happy blur.